Your horse has been officially diagnosed with Cushing’s disease. So now what do you do? Cushing’s, also known as pituitary pars intermedia dysfunction or equine pars intermedia dysfunction, is caused by a hormone-secreting tumor or enlargement of the pituitary gland at the base of the horse’s brain. Because horses with this disease are at increased risk of developing catastrophic laminitis and have issues resulting from compromised immune systems, precautions to control the syndrome should not be overlooked. When managed early, treatment is very successful in reducing clinical signs and allowing affected horses to live almost normal lives. Proper diet is crucial to treating this disease. Below is a comprehensive, simple guide to help you manage your Cushing’s horse. Horses with a history of obesity, metabolic issues, insulin resistance and those prone to ulcers have a higher chance of getting Cushing’s. Stress from diet and environment can also cause hormone imbalances that can lead to Cushing’s. Because of these factors, one of the most important things you can do is have a good nutritional management program. 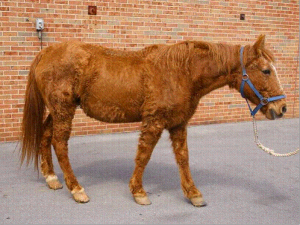 Horses with Cushing’s may have an abnormal hair coat outside of winter, laminitis or show a potbelly and fat pouches. Other symptoms include, but are not limited to, excessive sweating, increased water consumption, excessive urination, lethargy, poor athletic performance, infertility, muscle wasting, delayed wound healing and increased susceptibility to infections. Cushing’s is also more prominent in middle-aged to older horses. Cushing’s is a non-reversible disease and can progress if not managed. Luckily, if caught early, good nutritional choices, appropriate exercise and preventative care may be the best methods to ensure your horse has a comfortable life. In some cases, medication is needed as well. One of the most significant measures you can take is managing nutrition and diet. Supporting immune system function is very important. Provide a diet fortified with proper vitamin and mineral and high levels of antioxidants. All Triple Crown feeds utilize EquiMix technology, which provides an innovative blend of advanced supplements including prebiotics, probiotics and six different organic minerals. Also, because horses with Cushing’s are more prone to insulin resistance and high blood sugar, feeds and forages with higher non-structural carbohydrates (NSC) should be avoided. NSC’s are what make up the starches and sugars in your horses feed and forage. When looking at NSC values, your total diet should be below 20% NSC. When dealing with acute cases, keeping the NSC % much lower (closer to 10%) can help extend the quality and longevity of life. Triple Crown Low Starch is a 13.5% NSC, pelleted feed that is corn, molasses and alfalfa free. This will benefit horses that aren’t the easiest of keepers and those with varied insulin levels and metabolic issues. The fiber sources and added fat will give your horse energy. Triple Crown Lite is another pelleted feed with a low NSC level of 9.3%. Horses with Cushing’s are tricky because they can fluctuate from being overweight to underweight and back quickly. This feed is a good option for those who are more on the overweight, easy keeper side of the spectrum. This heavily fortified feed lets you feed as few as two pounds per day, and works well with horses who need very little feed or who have maintained weight on just grass and hay. Triple Crown Senior is a beet pulp-based, textured feed recommended for Cushing’s horses that have a hard time maintaining weight and need a little extra fat, without the extra carbohydrates. It has a high nutrient and fat content, is soft, and easily digestible, and has a low NSC level of 11.7%. Because most horses that get Cushing’s are middle-aged or older, this Senior feed can replace hay and be fed as the sole feed or with hay. Triple Crown Safe Starch Forage, with a NSC level below 10%, this forage is recommended for Cushing’s horses that should be removed from pasture or may not have a hay supply that is tested for starch and sugar content. Pasture grass can contain high NSC levels, so it should be avoided or provided minimally. Most hays have NSC levels of 10% to 15% and can be fed along with an appropriate Triple Crown feed to maintain a dietary NSC content under 20%. For horses and ponies needing a dietary NSC level under 10%, Triple Crown Safe Starch Forage is a complete, chopped forage with mineral and vitamin supplementation that can be fed as the sole diet. This product contains specially selected grass hay with low NSC levels and is molasses and grain free. It is 6% fat and contains the EquiMix technology found in all Triple Crown feeds. Check with your veterinarian for the best options for your Cushing’s horse, follow a good, regulated diet and exercise routine and keep up-to-date with all check-ups. With the proper management, your Cushing’s horse can continue to lead a life of quality and longevity.